MoBikeFed President Rachel Ruhlen is a community blogger for Gatehouse Media. This article appeared Mar 1, 2015. I'm not anti-car. Owning your own private automobile is great. You can go anywhere, anytime. The problem is that an automobile takes up a lot of space on the road, in the driveway, and in the parking lots of all the places you visit. Each additional vehicle affects traffic congestion incrementally. There are several parking spaces in your town for each vehicle you own. Our homes used to have front porches and now have big garages, but our SUVs are so big that we still have to park them on the street! When I was a kid, we packed a family of 5 into our 4-door sedan. We fought over who got a window or, if only one parent was present, who got to sit in front. Nowadays a 4-person family doesn't seem to fit in anything smaller than an SUV. Before my time, one car was enough for the whole family. In my day (imagine I'm saying that in an ancient, querulous voice), two cars were normal. Nowadays, every kid gets her own car when she turns 16. There are more cars than ever before, cars are bigger than ever before, and yet cars are emptier than ever before. Each SUV is also an SOV: a single occupancy vehicle. I'm not really an old curmudgeon (although I'm practicing). Like I said, the freedom to go anywhere, anytime is great. But it costs. It costs time, money, and space. It costs you individually and it costs our community. For every car (including SUVs and trucks), there are about 8 parking spaces. No matter where your car is parked right now, there are 7 parking spots somewhere in town that are empty, waiting for your car! That is hard to believe when you are circling fruitlessly, searching for a parking space, but it is true. That's a huge waste of space. That space could house the building of a business stimulating our local economy. It could be a home for a low-income family. It could be a park with growing trees. Instead, it is just empty, dead asphalt. Every car adds congestion to the road. The amount of space a car requires per person is enormous compared to any other way to travel. Buses are the most efficient way to move people. 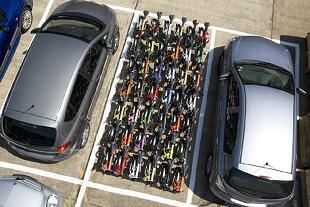 Bicycles are also very space-efficient. Car pooling is pretty good too; of course the more people in the car the more space-efficient. Motorcycles and scooters are not as space-efficient on the road but take up less parking space. But SOVs (whether they are SUVs or smaller cars) are horribly inefficient on the road and in the parking lot. Traffic jams are caused, not by an accident or a slow moving bicycle, but by all the SOVs. Once upon a time, a car gave someone the freedom to go anywhere, anytime. When enough people had cars, each additional car took a little of that freedom away from everyone. Bicycling gives me the freedom of going anywhere, anytime without the expense of an automobile. When bicycling isn't an option, carpooling is space-efficient and time-efficient. I lose a little flexibility of when and where I go, but I make up for it in shared expenses and time, especially if I'm the passenger. Read more of MoBikeFed President Rachel Ruhlen's articles on the President's Blog page. « Previous story: Captain Kirk steals Spock's bicycle . 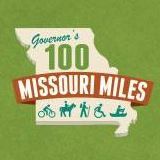 . .
» Next story: MoDOT Commission Chair: Not My Bridge, Not My Road! A city where streets are shared space?